The Hazelwood Group of Companies is a diverse collection of small and medium sized enterprises, all owned and operated by the same family. 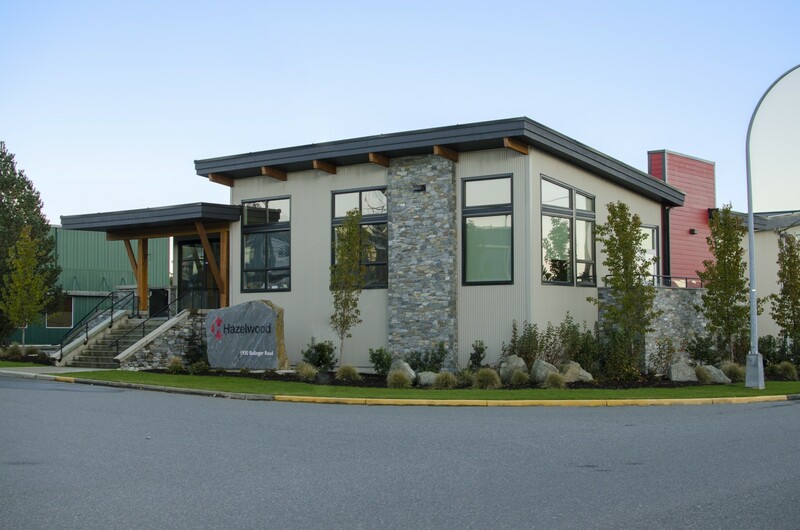 Our corporate offices are located in Nanaimo BC with employees working in both Canada and the United States. Our related companies work within the Construction, Quarrying, Manufacturing, Retail & Real Estate Development Sectors. The Hazelwood Group consists of Hazelwood Construction, Hazelwood Holdings, K2 Stone, Baywood Glass, Steel Container Systems, Dunk Pools and GeoBreak. Hazelwood Holdings is the founding company that has grown the Group of Companies into what it is today. Jack Whittaker was a prominent figure within the British Columbia construction industry. When Jack retired he moved to Nanaimo, where he continued to work on various property developments on Vancouver Island. During that time his son Sid decided to move his young family from the Okanagan to pursue a joint construction venture with his father. Through hard work and perseverance Hazelwood Construction started working in the heavy civil construction industry on Vancouver Island. Jack Whittaker’s development company Hazelwood Holdings Inc. has been involved in a variety of residential development projects on Vancouver Island. Hazelwood Holdings is responsible for Land Procurement, Land Development, Sub-Division Creation and Re-Zoning Management. Rockwood Heights, located in Nanaimo BC is Hazelwood Holdings most recent development project. The master planned community offers modern luxury with both single family and multi-family developments. Established in 1993 by father and son team, Jack and Sid Whittaker. Hazelwood Construction Services Inc. has been in business for over 25 years, during that time they have accumulated a diverse construction portfolio, including run-of-river hydro developments, bridge installations, road construction, water & sewer installations, as well as a variety of industrial, commercial and residential construction projects. As Hazelwood Construction stabilized Sid Whittaker started looking for additional opportunities, that eventually led him to start a decorative stone quarrying business, what is now known as K2 Stone. K2 Stone is one of the largest producers and distributors of natural stone building products in Western North America. K2 Stone specializes in thin stone veneers, full bed building stone, cap stones, flag stone, hearths, mantels, landscape stone and a variety of custom dimensional stone products. K2 Stone sources stone from quarries in British Columbia, and Montana, with store locations in Vancouver, Victoria, Kelowna, Nanaimo, Calgary, Edmonton and Seattle. In May of 2005 Jack Whittaker started a joint business venture named Baywood Glass. Baywood Glass provides Nanaimo with exceptional service in the repair and replacement of automotive and residential glass. As an authorized ICBC Glass Express facility, Baywood is able to process ICBC claims directly. Baywood Glass also provides residential and commercial glass installations, repair or replacement. Our residential glass applications include vinyl windows, skylights, glass shower doors, mirrors, tempered balcony glass, sealed glass units, fireplace thermal glass, kitchen cabinet door glass, glass shelving and more. Acquired in 2006, Steel Container Systems Inc. (SCS) was purchased by Sid Whittaker from business dealings with K2 Stone. SCS is a proud Canadian owned and operated Lean manufacturer that has been serving the Waste, Recycling, Construction, Forestry, Oil and Gas and Mining industries in North America for over 20 years. The SCS sales and design team offers clients customer driven customization to meet their individual operation’s needs. SCS provides project management, from concept, through construction for unique projects which require professional certification. By 2015 with five different businesses started, the Hazelwood brand has grown from a family operated organization to a professionally managed business. The Hazelwood Group employs more than 160 full time staff throughout the companies, operating in both Canada and the United States. Off of this foundation Hazelwood is now launching two new business ventures, Dunk Pools and GeoBreak Rock Breaking Solutions. Dunk pools (a division of SCS) are affordable, efficient, smart, recreational in-ground or above ground pool systems for residential clients. Our pool systems are pre-fabricated, pre-engineered steel units designed to fit into any size of backyard – whether its a small backyard, a smaller backyard, or even the smallest of backyards. You only need a 10 foot by 10 foot area to begin reaping the rewards that dunking brings. Not to mention we will have you swimming 3 to 5 days after your pool is delivered. GeoBreak formerly known as Ecoburst was founded by Sid’s son, Todd Whittaker. GeoBreak provides low impact rock breaking solutions for both commercial and residential applications. We supply our customers with sensitive rock breaking products such as NxBurst Cartridges and Non-Explosive Expanding Grout. Our company sells sensitive rock breaking products, provides training for NxBurst certification programs and offers consulting services for projects that require low impact rock breaking demolition services. Our fundamental entrepreneurial values have allowed us to innovate and succeed. We are excited for the future growth of Vancouver Island North, as our transportation infrastructure continues to expand. We enjoy an affordable cost of living with beautiful ocean views and full accessibility to sell our products to the North American market.